A bright and breezy start, we arrived at Notre Dame well before opening time, our goal to beat the queue. We failed. A long line of tourists already stretched out through the square away from the entrance. We stood woefully at the back, but despite my reservations the line moved super fast and it was no time before we got to go inside. 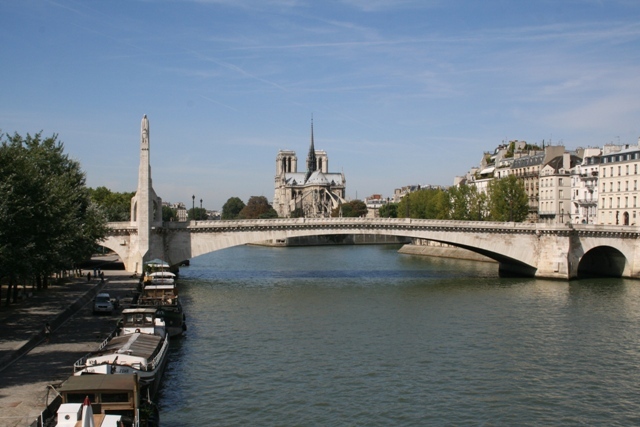 I love this area of Paris – the Ile de la Cite – historical heart of the city and jam packed with must-see sights and gorgeous views of the Seine. It is also jam packed with tourists and traffic, but one look at the architecture and all is forgiven. Notre Dame is stunning, easy to see why Victor Hugo called it “a symphony of stone.” The Gothic style cathedral, full of gargoyles and interesting features was begun in 1163 and completed in 1345. Imposing from the outside, inside it can accommodate over 6,000 worshippers. I was a little bit disappointed when we got inside. Nothing to do with the building or its treasures, but the atmosphere let me down. It was so busy, packed with tourists, cameras flashing, camcorders whirring, loud voices and just as far away from a sacred and spiritual atmosphere as you could get. Ten million people visit every year, it must be like that most of the time. Noise aside, there are some pretty special things to see. 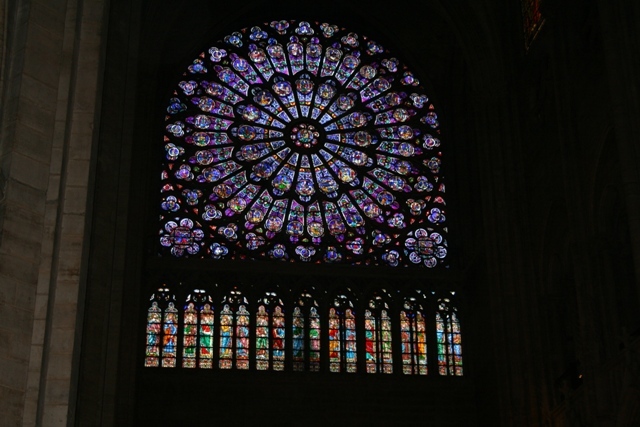 We all loved the North and South rose windows – spectacular and dating back to the 13th century. Unfortunately we didn’t experience the sun shining through them. The choirscreen from the 14th century with its depictions of Gospel scenes is also beautiful. The Victor Hugo connection to this cathedral intrigues me – its state of disrepair inspired him to write the Hunchback of Notre Dame in 1831. This in turn helped to stimulate the restoration of the church. Quasimodo lived in the South Tower where the great bell is housed. Any thoughts of going up there were instantly dismissed when we saw the huge line stretching right around the block. In hindsight, dragging a 3 year old up 387 steps to the top might not have been such a great idea anyway. So, we missed the close up views of the gargoyles and a potential glimpse of the kestrels which nest and breed in the tower. Maybe next time…..
Outside in the square we found the zero point – all road distances in Paris are measured from here. As well as being the historical heart of the city, it is also the geographic heart. 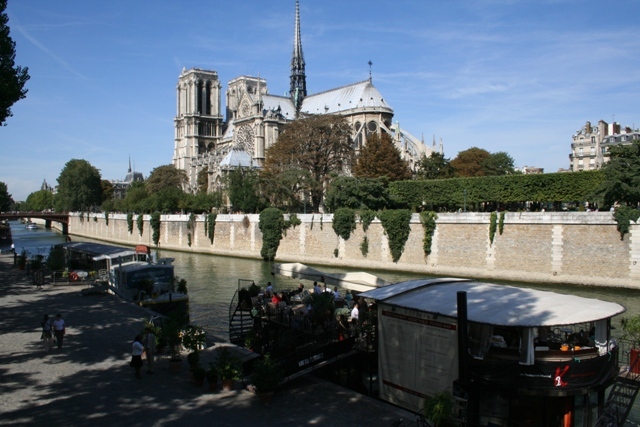 An afternoon of strolling followed – Son had had his fill of churches and monuments, so we just ambled around the Ile St Louis – so peaceful and leafy, a real contrast to the busy Ile de la Cite. We got some fantastic views of the cathedral from its western tip and spent ages listening to some wonderful buskers. The Ile St Louis is full of exclusive and lovely old mansions – Baudelaire once lived here. The main road – St Louis en Ile – is perfect for strolling. Narrow and full of delightful little shops selling quirky and interesting bits and pieces. 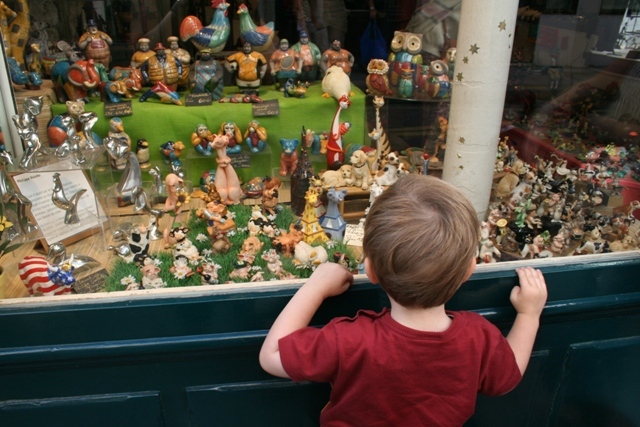 Son was fascinated, not usually a fan of shopping, he was keen to visit all the establishments here. We were all keen to visit the Maison Berthillon, a fabulous ice-cream shop. Another long queue (seemed to be the theme of the day), but it was worth it – the vanilla ice cream was the best I have ever tasted. Back towards Notre Dame we got some more great views of the church and the river. The ice cream comes highly recommended! Wish we had been to Notre Dame during a service, I think it would have had a special atmosphere and much more so than when tourists are all crammed in! 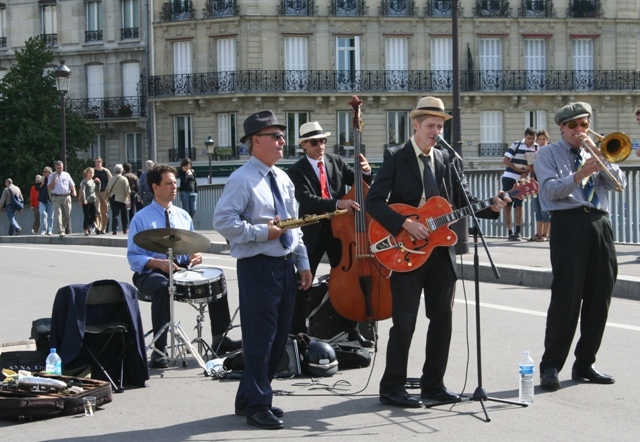 We love Paris too, can’t wait to go back! I’m enjoying your blog so much. Your photos are great and your writing is captivating. It definitely makes me realize I need to go back to Paris. Thank you. 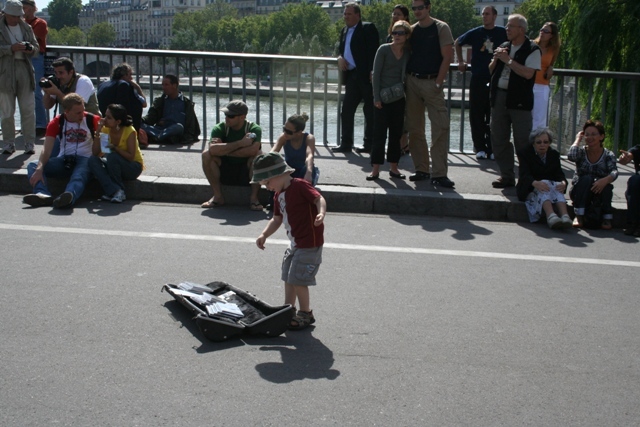 Love the picture of your little guy at the busker’s case. Gosh, yes, three hundred and (what?) steps and a three year old? Probably one for another time. You’d have to be very committed! Definitely – too much effort for us! The trouble with any sights in a city that are on everyone’s must see list, is that everyone seems to want to view them at the same time. Normally, I would suggest leaving the more popular attractions until the tour groups go back to the hotels. 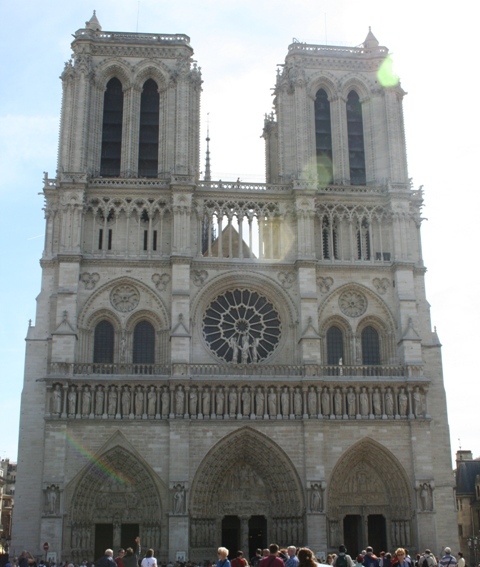 But in Paris, people are at places like Notre Dame in great numbers all through the daylight hours. Try lunchtime, still no guarantee the crowds won’t be there. Thank you for the tip – hadn’t thought about lunchtime but worth a try! Thank you – we did love it! Sometimes you don’t appreciate the places you see everyday – I know I am guilty of that for sure. Love Paris. I live next door in Luxembourg and have been several times, but it never ever gets old. Luxembourg is also really nice – I’ve been once a long time ago. You’re lucky to live not so far from Paris as well! 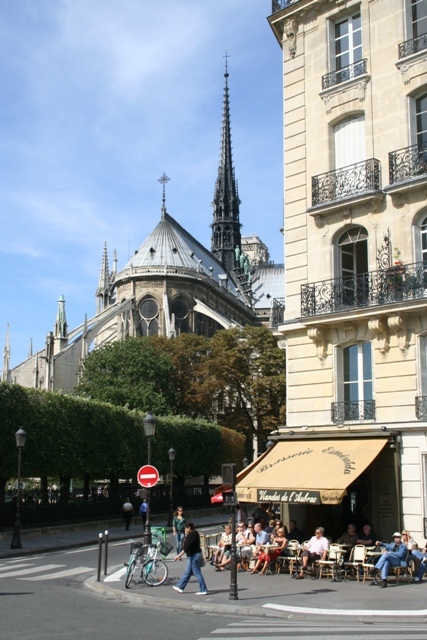 Love this part of Paris – I think the back view of Notre Dame is even prettier than the front! Did not know you could climb up, must have missed that on the last visit as it was pretty crowded. I know what you mean about the view – I think it looks better from the back as well! You take lovely photos. Your writing has a relaxed holiday vibe, so lovely also. Thank you for reading and dropping by! I am a new follower and I am really enjoying checking out your blog. Great photos!